Last night, Real Salt Lake took a 2-0 aggregate lead in their CONCACAF semifinal matchup into Ricardo Saprissa Stadium, home of the Saprissa "Monstruo Morado" known as the "Monster's Cave." Though one of the most intimidating places in all of North and Central America to play, perhaps second only to Estadio Azteca, Real Salt Lake played superbly in a 2-1 loss, winning the series 3-2 aggregate. Real Salt Lake was certainly taking the competition seriously, with a full strength worldwide starting lineup of Nick Rimando, Chris Wingert, Nat Borchers, Robbie Russell (Ghana), Jamison Olave (Colombia), Will Johnson (Canada), Kyle Beckerman, Andy Williams (Jamaica), Javier Morales (Argentina), Fabian Espindola (Argentina), and Alvaro Saborio (Costa Rica), the former Saprissa star. As soon as the teams entered for the start of the second half, Luis Diego Cordero opened the scoring with a rocket past Rimando for a 1-0 Saprissa lead. RSL remained in control of the aggregate score, and tied the game in the 61st minute. Center back Nat Borchers got a head on a corner kick by teammate Javier Morales of Argentina, which was then blocked by Saprissa's Victor Cordero (no relation to Luis Diego Cordero). RSL defender Jamison Olave of Colombia, the 2010 MLS defender of the year, volleyed the loose ball into the net. Having all but wrapped up the aggregate win, Real Salt Lake gave up a penalty kick in the closing minutes of the match. Ned Grabavoy, who had replaced Andy Williams as a defensive substitute in the 58th minute just before RSL tied the game, tripped Allen Aleman in the box. 86th minute substitute Alonso Solis, who had just entered the game, put the PK in the net with his first touch in the 87th minute, but it was too little too late for Saprissa, who won the game 2-1 but lost the aggregate match 3-2. Real Salt Lake's opponent in the CONCACAF Champions League final will be the winner of tonight's match between Cruz Azul and Monterrey of Mexico, in a two game aggregate series on April 20 and April 27. Monterrey takes a 2-1 aggregate lead to Estadio Azul, and are almost certain to be Real Salt Lake's final opponent. The April 20 match will be held in Sandy, Utah, while the April 27 match is in Monterrey, given that the Rayados don't choke against Cruz Azul tonight. And mighty Monterrey almost choked. 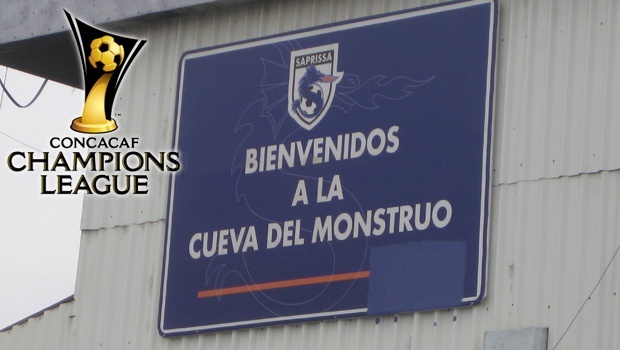 Cruz Azul took a 1-0 lead over Monterrey, taking the series lead on the away goals rule. Cesar Villaluz scored a rebound of a saved shot by teammate Hugo Droguett of Chile in the 23rd minute, and the crowd went wild until the final ten minutes of the game. Then, Chilean defender Waldo Ponce of Cruz Azul was called for pushing in the box on a corner kick. The referee awarded a penalty, which was coverted by Humberto Suazo (yet another Chilean!) of Monterrey in the 81st minute. The crowd was silenced as Monterrey won 3-2 aggregate. Has an MLS team even won this competition? I seem to recall DC United doing well in the inaugural year back years ago when were were in that tiny dive bar in Costa Rica. As I recall, they were playing Toluca and the Costa Ricans were actually pulling for us! DC United won the CONCACAF Champions Cup in 1998, before the format changed to a full-fledged Champions League in 2008. And yes, you remember correctly, 1-0 over Touluca on an Eddie Pope goal. And yes, the Costa Ricans always root against the Mexican sides. Before 1996 when MLS began, the A-League teams competed in the Champions Cup. Other than DC United, no USA team has ever made it to the final until now. The last two finals were both all-Mexican matchups, with Cruz Azul losing both times, to Atlante in 2009 and Pachuca in 2010, the latter featuring USA midfielder Jose Francisco Torres.